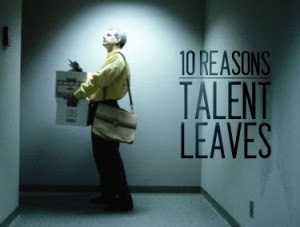 Ten Reasons Your Top Talent Will Leave You - Something New Everyday! Have you ever noticed leaders spend a lot of time talking about talent, only to make the same mistakes over and over again? Few things in business are as costly and disruptive as unexpected talent departures. With all the emphasis on leadership development, I always find it interesting so many companies seem to struggle with being able to retain their top talent. In today's column, I'll share some research, observations, and insights on how to stop the talent door from revolving. Ask any CEO if they have a process for retaining and developing talent and they'll quickly answer in the affirmative. They immediately launch into a series of soundbites about the quality of their talent initiatives, the number of high-potentials in the nine box, blah, blah, blah. As with most things in the corporate world, there is too much process built upon theory and not nearly enough practice built on experience. More than 30% believe they'll be working someplace else inside of 12 months. More than 40% don't respect the person they report to. More than 60% don't feel their career goals are aligned with the plans their employers have for them. More than 70% don't feel appreciated or valued by their employer. So, for all those employers who have everything under control, you better start re-evaluating. There is an old saying that goes; "Employees don't quit working for companies, they quit working for their bosses." Regardless of tenure, position, title, etc., employees who voluntarily leave, generally do so out of some type of perceived disconnect with leadership. 1. You Failed To Unleash Their Passions: Smart companies align employee passions with corporate pursuits. Human nature makes it very difficult to walk away from areas of passion. Fail to understand this and you'll unknowingly be encouraging employees to seek their passions elsewhere. 2. You Failed To Challenge Their Intellect: Smart people don't like to live in a dimly lit world of boredom. If you don't challenge people's minds, they'll leave you for someone/someplace that will. 6. You Failed To Care: Sure, people come to work for a paycheck, but that's not the only reason. In fact, many studies show it's not even the most important reason. If you fail to care about people at a human level, at an emotional level, they'll eventually leave you regardless of how much you pay them. You have hit the right button through this article.